I was asked by the Hutt City Council to come up with a concept idea for the Taita Cemetery in response to increasing demand and interest in natural burials. A site was found – a scrub and regenerating Manuka covered hill on the edge of the cemetery surrounded on 3 sides with regenerating native bush. The concept design is based entirely on the simple form and meaning of the emerging native fern frond. 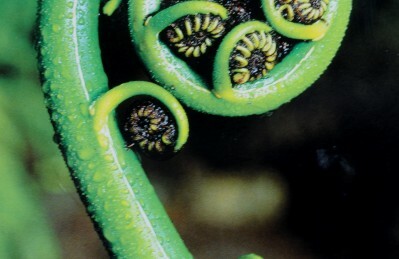 The fern frond inspires the “Koru” maori symbol and symbolises new life, regeneration, renewal and growth, both physically and spiritually. Translations also include the concepts of “everything being reborn” and “hope for the future”. This therefore seemed to be an entirely appropriate element to develop the design concept around, and it also suited the practical requirements of the layout very well. The design begins with the main “stem” – a wide pathway which is also accessible by vehicle. This curves up and around the hill with smaller “fronds” -pedestrian pathways – curving off from this and leading up to semi-secluded burial areas. Both the main path and the secondary paths are lined on one side with an avenue of tree ferns. Each burial garden area is encircled with tree ferns, with the central tree species changing for each area, providing variety and an easily remembered identification reference for visitors to find the area where their loved ones are located. Each area also has a central raised deck which provides some seating during burial ceremonies and for casual visitors. There is also a main lookout deck area at the top of the hill for ceremonies and general visitor use, and this provides spectacular panoramic views down the Hutt valley and over the surrounding hills. The design is still in the conceptual stage but was extremely well received and it is hoped it will become a reality in the near future.